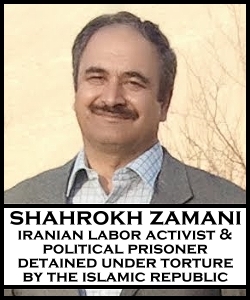 Shahrokh Zamani From Rajaei-shahr to ILO: How Long Silence? How long will the policy of silence and passiveness towards the suppression of workers’ legal activities last? I, Shahrokh Zamani, member of the House-Painter Workers’ Union of Tehran, was sentenced in the anti-worker court of injustice of the Islamic regime to 11 years’ imprisonment for legal union activities. We, 12 million employees, working in industry and mine, oil and gas, petrochemicals, agriculture, and construction, including our family members, are the majority of the population of Iran. Without exaggerating, it could be said that all of the material and immaterial wealth of society are the products of the work and toil of our class. In attesting this truth, just imagine that if our brothers and sisters in oil and machinery industry stop working: the whole country would be paralyzed and economic life would stop after one week. In view of this, what have been the achievements of Islamic rule – whose claims to justice and fairness have deafened the ears of the whole world – for our class? – There has been complete abolition of job security through the introduction of contemporary and blank signed contracts, as a result of which workers are totally enslaved. – There has been a devaluation of wages down to the level of one fourth of the poverty line, namely 390,000 toumans. – Domestic production has been annihilated by lifting customs, importing junk by the mafia gangs of the regime, lay-offs of millions of workers in various service and industry sectors, including shoe, textile, garment, carpet, sugar, rice, tea, etc. – And finally, in parallel with the brutal exploitation, there is suppression of the slightest voice of protest, strikes, and workers’ organizations and activists such as: Tehran and suburbs Vahed Bus Syndicate, Tehran Painters, Haft-tape Sugar cane Syndicate, Saqez Bakers’ Union, Coordination Committees to Help Form Workers Organisation, Iranian Independent Workers’ Union, Coordinating Committee to Follow up etc. etc….So it is with the efforts and services for workers under the rule of Islamic justice. In view of the domestic and global pressures against the policies of the anti-worker regime of the Islamic Republic, the regime has turned to a new trick for suppressing workers’ legal and union activities. In this approach, the regime sentences worker activists to long-term imprisonment consequent to fabricating stories against them, connecting workers’ legal and union activities with [political] opposition organisations, and accusing them of subversive activity. This is intended to cause fear and defection among activists and organizers of workers’ legal struggles. This is a sample of the sentences passed against worker activists. This shows clearly that the Islamic Republic of Iran does not even adhere to its own laws. Its courts are like puppets in the hands of this mafia regime and, without any judiciary independence, follow orders and pass dictated sentences. Can such a regime adhere to international laws? Does the ILO not see all of the expulsions, arrests, imprisonment, and whipping of worker activists? With respect to the recognition of freedom of association, strike, etc. by ILO, the question of why the ILO continues to admit the Islamic Republic of Iran to its membership has come up for workers – such a regime that severely suppresses the building of workers’ organisations and strikes, and who imprisons workers several years on the basis of false accusations? Why does the ILO not even protest against its anti-worker acts? What is this policy of “one roof and two climates” [a Persian saying implying inharmonious contradiction]? We worker activists, who are in the worst condition from being subjected to repression and unbridled autocracy, and who are bereft of the slightest legal rights, expect you, the Director-General of the ILO, with respect to the membership of the Islamic regime in the ILO, to do your best to obtain the release of jailed workers in Iran, and to secure the freedom of workers’ activity in Iran according to the agreements of the ILO, including the right to build organisations and strike. We expect you to stop the Islamic regime from continuing the suppression of workers’ organisations and activists.